I gave it a shot today. I paddled the tandem folder on a local reservoir on calm waters with sunny skies and 7 degrees C. I used double-blades and a single blade from the rear seat. I built the seat up to about 7-8" off the floor for paddling with the single-blade, bent-shaft, a paddle I use increasingly often when canoeing. With the rudder engaged the boat tracked beautifully. I was freed up from adding correction to my strokes, the rudder compensated nicely, and my speed was pretty good. Verlan Kruger, himself, would have approved. Thanks BJones for the ideas re: single-blade paddling. I sense it will have a role in future paddling of my tandems. I have a board which I rest across the top of the coaming and sit on when I fish out of my AII. I use a canoe paddle from this position and it works pretty well on calm water. I must admit that I haven't tried the canoe paddle from the seated position except when sailing. I will certainly give this a try next time I go out. I also use a canoe paddle when sailing as this stops the two bladed paddle from hitting the sails. It,s a long one by Bending Branches called "Expresso Plus" 58 inches long as i use it from the seated position i can,t see why it wouldn,t be good when not using the sails. If the boat is used as a two seater it would be better if the paddlers used canoe paddles. I have seen advertising photos with up to four paddlers in one of the long kayaks, it would be even better if they had canoe paddles which is what the British commandoes at least experimented with in world war 2 in their four seaters. Seen in "Cockleshell Canoes" by Quentin Rees, also it would be of interest to make a "Lateen sail" based on the ones used in WW 2 with a short mast. 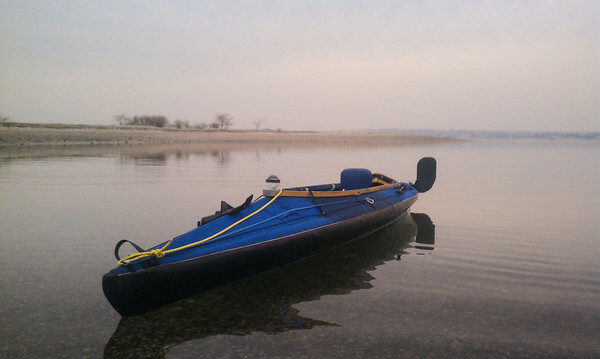 Had a great solo paddle with the AII a couple days ago on Long Island sound. 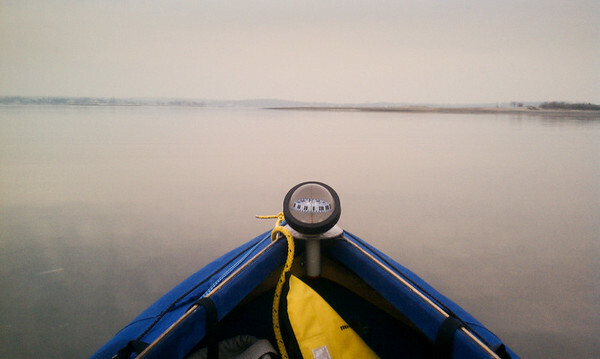 Weather was a little warmer with the overcast 40~50˚F and perfectly flat water. Was a great opportunity to try out my new Klatwa paddle and until then unused Silva (Nexus) UNE 70 compass. Had a great time. Love this boat. Looks really nice! When you paddle solo, do you sit at the back seat in the same position as if you were two, or do you move the seat a bit forward? I move the seat forward so that I can use the #3 (corrected) rib as a foot brace, so the seat is close to center... I also put the rudder peddles at this rib in case I decide to sail or paddle with the rudder. I use the Long Haul comfort seats with a series of straps so I don't need to put any holes in my deck. Works fine and is infinitely adjustable. Last edited by DLee on Wed Jan 16, 2013 7:43 pm, edited 1 time in total. Wait! Newbe question: If you are paddling solo in the AE2 or LH MK2 and the rudder, rib #4, is where your feet would be when you are in the tandem position how can they be on rib #4 in the solo position with the seat forward? Wouldn't you legs be bent a lot? Or do you have to put the rudder pedals on rib #3 closer to the bow? How? BTW, your kayak looks great! Blue looks very nice. my bad Frank, I was thinking of my T9 configuration where the third rib is the peak of the cockpit - you are correct, on the AII or MKII that is the second rib. So, I am putting my feet on the third rib, not the fourth.